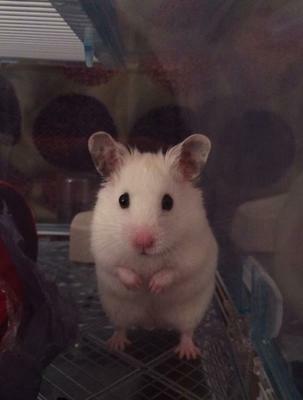 My beloved little Hammy (‘Hamilton’) got me through some horrendous times – from the loss of my 7-year-old daughter (we bought him for her) two years ago and then the death of my father last year and the on-going illness of my brother. Sometimes the only thing that got me up in the morning was hearing him mooching about – knowing that I had to get up and feed him. He was a lovely little thing, a bit of a bruiser (he’d nip if you disturbed him while he was sleeping), but he’d nuzzle your hand for treats and come out for a look when I came home from work to an empty house. These past few years have been so painful and I was often painfully aware that I was focussing all my energies on looking after this tiny animal. I was also self-conscious that other people, even close friends, thought I was completely crazy. Animals teach us what it means to be human – that we need to love and care for things to be able to live, no matter how painful the loss when they die. It’s hard for people to bear other people’s grief over time, but animals can just be there. I remember our old dog lying at the foot of my Mum’s bed all the way through her long, last illness. She wouldn’t budge. I loved this little creature. He helped me through a horrendous time. My Dad loved animals (particularly birds – little creatures), so I’m going to imagine that he’s looking after him now. Thank you Hammy. Don't take notice of anyone who thinks that it is strange to be so caring about Hammy. He may not have been a dog or cat but you loved him and depth of love is not restricted to 'certain' creatures. I get upset when I see a dead creature on the side of the road, or a dead bird, and they are not personal to me. So I can imagine that the death of Hammy must have been devastating for you as he was your 'comfort', and a 'reason' to stay strong during bad times. Perhaps one day, you will find another little feller that will rely on you, whether it's a hamster, a cat, dog, guinea pig, budgie or whatever. He won't replace Hammy but he/she will find another place in your heart for him. In the meanwhile, mourn Hammy as much as you like, without feeling 'odd' but remember also how much joy and comfort he brought you and how he must have been one lucky hamster to have you to look after him.